Splash white Water Rafting is the key place for White Water rafting Scotland, we are rated independently by Tripadvisor as the NO 1 boat provider in Aberfeldy. Aberfeldy is a small, scenic town in the Highland Perthshire area. Aberfeldy along with Pitlochry are well known as the hubs for white water rafting ie river rafting here in Scotland. We are really proud of our Tripadvisor ratings as they are based on real customer experiences, reviewed by our customers in their own time after they have left our establishment. We see it as an independent benchmark of the quality service and passion we bring to our industry. 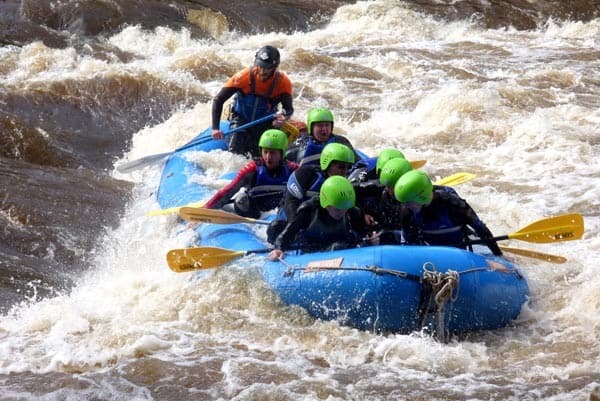 Scotland has been blessed with ample amounts of rain, in most industries, this is not seen as a positive but in the world of river rafting, it is indeed a blessing. The rivers collect water from a wide catchment area (surrounding valleys, mountains and the like). This catchment area feeds that water into our rivers. The main areas for white water rafting Scotland are as mentioned, up in the Highland Perthshire area. However, there are numerous rivers that we raft in Argyll like the River Orchy and even further afield like the River Findhorn and more. The two most popular rivers to raft in Scotland are the River Tay and the River Tummel. The River Tay is a fun bouncy river with enough adventure for the whole family and more. The river Tay runs all year round and can vary over 10 feet in height depending on the season, rain etc. However, the river Tummel near Pitlochry is a dam released river and only runs from June through September. To raft the River Tummel you must be aged 16 plus, this river has some spectacular rapids including an 18ft twin-tier waterfall at the end!! Now that is excitement!! Lynn of Tummel rafting videos. Here is some videos of our customers having a great time on the last rapid of the river Tummel! However, we have extensive partners throughout Scotland, providing us with the very best in accommodations and transport. As a result, we regularly organise rafting adventures from both Edinburgh and Glasgow. Furthermore, we have a long and proven record working with stag dos, hen parties. In addition, we also have a history working with schools, corporate events, and charity events. For these groups, we fulfil all aspects of their rafting adventure from accommodation, transport, photography and video work, as well as further activities and tours with our partners in the area. If you are looking for white water rafting Scotland then look no further, we are passionate about adventure activities and are keen as mustard for you to come up and experience our passion.